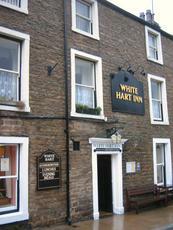 The White Hart is now a genuine free house being bought from Enterprise in the winter of 2011. The owners have undertaken a full refurbishment to the bar, kitchen and bedrooms. There are 2 bar rooms with the larger having a white multli fuel stove. The landlord is keen on his real ale. When we visited there was Theakston bitter, Wensleydale Semmer water and Salamanda Cracker. There was a display of previous beer pump clips and all the local micros were represented. All the beers tasted were in good condition. There is a separate dining room and a pub food menu for the bar. We had some interesting sandwiches. Much of the meat is sourced locally. The landlord said that there are 5 letting bedrooms. It is good to see a choice of real ale in Hawes for a change.